Ewald O. Dahlquist was born October 26, 1925, to Oscar and Ester (Svensson) Dahlquist in Oakland, Nebraska. 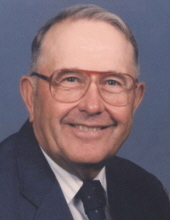 He passed away April 1, 2019, at St. Joseph’s Hillside Villa in West Point, Nebraska, at the age of 93 years. In the mid 70’s, they started taking winter trips which eventually turned into 5 months at Apache Junction. He was preceded in death by his wife, Patty; parents; sister, Bernice (Eddie) Naggatz. "Email Address" would like to share the life celebration of Ewald O. Dahlquist. Click on the "link" to go to share a favorite memory or leave a condolence message for the family.